Staging your home refers to adding to the appeal of your home so that it becomes more attractive to buyers and you can sell your home quickly at good value. If done right, staging can really mean the difference between a great sale and a horrible one. So here are a few tips and tricks that can help you properly and attractively stage your home. Tend to the outside: Make the outside of your home such as the porch, curb, and driveway area, as attractive and neat as possible. This increases the chances of selling quicker as it can appeal to people driving by as well. Trim your lawn, repaint porch if necessary, place a few plants, turn on lighting in the evening, etc. Also make sure your house number is clearly and boldly shown somewhere. 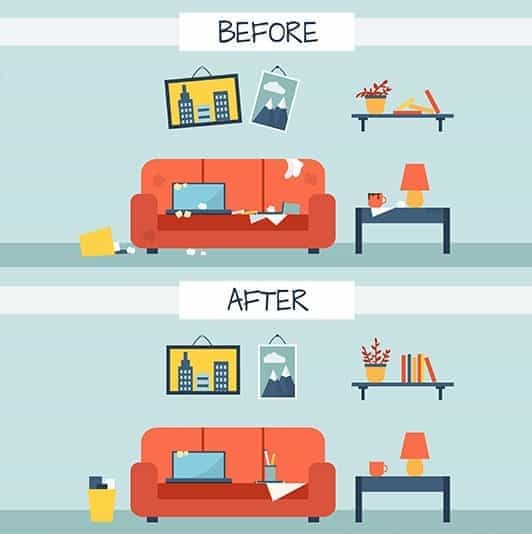 Clean everything: The interior of your home should be spick and span! This means not just basic cleaning but deep cleaning that cleans even the smallest of showpieces. If you can’t do it, hire professional cleaners for a single service. Remove anything unnecessary: Your home should look more picture perfect than homely so that means you need to avoid cluttering anything. Keep essential items and store them neatly in place. Also remove anything stained or dirty, as well as mismatched furniture. Use a friend’s garage to store all that extra stuff for the move. Add a few touches: You just removed extra stuff, mismatched furniture, etc. – that’s great! Now you need to add some stuff like fresh flowers, a bright fruit basket, a frame, a matching hand towel in the kitchen, etc. Color coordinate the rooms: In general, the bed coverings, carpet, furniture, and accessories of every room should match. This doesn’t have to be a perfect match but it should be along the same lines. The best trick is to pick bed coverings, rugs, and accessories that match the room’s paint and go well with the furniture. Be sure to apply the same rule to kitchen and bathrooms as well. Set up your dining table: A bare table can look very uninviting so set it nicely with a matching, clean dinner set. Aesthetically arrange furniture: Symmetry and aesthetics are attractive so rearrange your furniture in an arranged manner. Don’t go for chic, random placement, the safest trick is to maintain symmetry.